Hana Homestay is located in the peaceful area near the My Khe Beach which is a famous tourist place in Da Nang city. If you are finding a best place for beach and seafood restaurant home living but not far away the center of Danang city, Hana Homestay will be an ideal place for you. All rooms are equipped with air conditioner, private bathrooms with hot shower, free wifi and shared a kitchen, living area, washing machine. Hana Homestay has 2 double rooms with one double bed, 1 family room with 2 double beds and 1 dormitory room with 8 single beds. 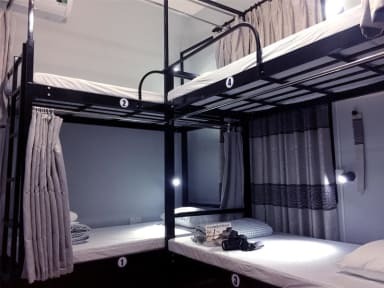 This hostel is a good place you sould go to because the staff here is being very helpful they will help you the best they can and the place is very near the beach the loveliest place in danang for jogging. Very good location to stay, a lot of seafood restaurant and helpful staff. Also, a lot of travel agencies to help for your journey. Such a steal to stay here. Beyond cheap and good clean place. Bathrooms are even washed a few times a day if many people are booking. Since it’s shared bathroom. Good area away from noise but walking distance of beach. Can rent a bike for less than 6 bucks. Breakfast not included but about 1.30 usd. Private rooms cheaper if booked in person last minute. Vs online prices. Would stay here again! Everything was great. Little bit of a language barrier but that’s being picky. Would stay here all over again! My 2 nights here were very enjoyable. I was in the 8 bed dorm and all of my "roommates" wanted the AC set to 26 which is too warm for me to sleep comfortably so I asked Hana if I could have a fan put next to my bed to keep me cool and she gave me one to keep during my stay! The laundry service is literally right outside the front door and is 45k for up to 5KG which is the cheapest I have seen and I got same day service! Beds were nice with privacy curtains, good location, friendly staff! We stayed here in May in the dorm room and thought we’d come back as it was a really nice place. Quiet and clean! Decided to go with a private room this time and was perfect. Really big and nice big bathroom too!